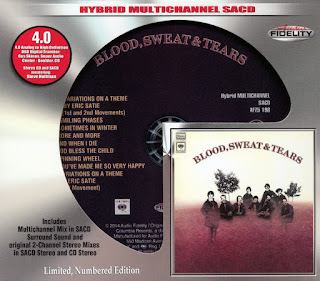 Blood, Sweat & Tears self-titled second album from 1969 is the latest Hybrid Layer Stereo Super Audio CD release from Mobile Fidelity Sound Lab. Utilizing Erik Satie’s Variations On a Theme to quietly open and close the album, in-between they mixed songs from exciting, contemporary writers; Laura Nyro – “And When I Die” Traffic’s “Smiling Phases” and Barry Gordy – “You’ve Made Me So Very Happy”, with original material; “Spinning Wheel” and “Sometime In Winter”, creating virtually ‘greatest hits’ and concert staples with all. Engineered by legendary Columbia staffers Roy Halee and Fred Catero, the blend of jazz-pop arrangements with just a hint of classical, created a breakthrough recording that was constantly featured on radio for years.